Scale Model Soup: Does size matter? I'm a man of contrasts, just ask my girlfriend. She's been trying to put a label on me for the last five months. Epic fail. That's why I'm particularly amused at the contrast between my current work-in-progress (WIP) and the newest acquisition to my stash. You may recall my interest a few weeks ago in learning how to rig bi-planes, and thus my tiny little 1/72 Nieuport 17 has progressed nicely. I've painted it, applied the Future, and decaled it. So far so good, more or less. You can see the little guy (next to a quarter) there on the white card on top of my new Trumpeter 1/32 F-105D. The model arrived yesterday thanks to a sweet deal on ARC. Only $85, shipping included! 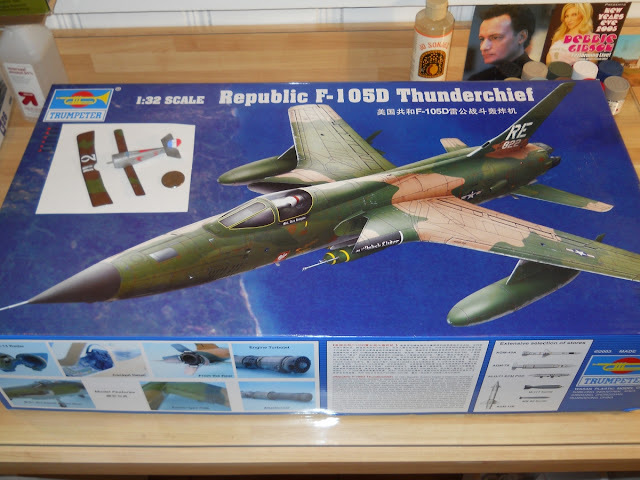 I've always a thing for the F-105, and I have ten or so in the stash from 1/144 to 1/72 to 1/48. 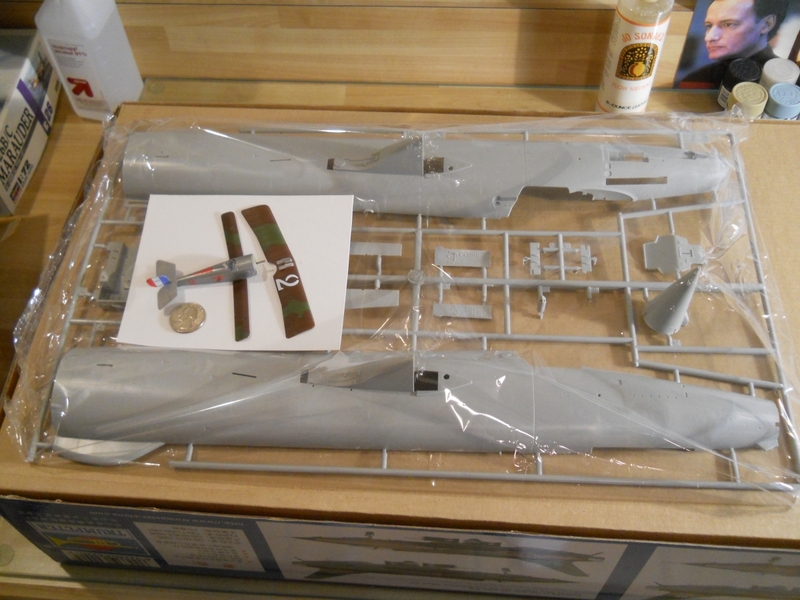 In fact I think one of the earliest models I built was the early (very early) Monogram F-105 from the 1970s. I'll have more to share about a chance crossing of F-105 history and one of my models in the future, but for now I'm enjoying the size difference between these two models. And that's just the forward fuselage of the F-105, less the tail assembly! While I'm mentioning the Nieuport 17, I should point out something I learned tonight about Eduard's decals. Despite my adoration of Solvaset, they had practically no effect on Eduard's decals. So if you've got any of their kits in your stash, be forewarned. Oh, and yes that is a Debbie Gibson card at the back of my workbench. I had a crush on her as a teenager and saw her in concert a few years ago for New Years. So what?